Principal interactions of structural proteins at cadherin-based adherens junction. Actin filaments are associated with adherens junctions in addition to several other actin-binding proteins such as vinculin. The head domain of vinculin associates to E-cadherin via α-, β - and γ -catenins. The tail domain of vinculin binds to membrane lipids and to actin filaments. Adherens junctions (or zonula adherens, intermediate junction, or "belt desmosome") are protein complexes that occur at cell–cell junctions in epithelial and endothelial tissues, usually more basal than tight junctions. An adherens junction is defined as a cell junction whose cytoplasmic face is linked to the actin cytoskeleton. They can appear as bands encircling the cell (zonula adherens) or as spots of attachment to the extracellular matrix (adhesion plaques). Adherens junctions uniquely disassemble in uterine epithelial cells to allow the blastocyst to penetrate between epithelial cells. A similar cell junction in non-epithelial, non-endothelial cells is the fascia adherens. It is structurally the same, but appears in ribbonlike patterns that do not completely encircle the cells. One example is in cardiomyocytes. cadherins. The cadherins are a family of transmembrane proteins that form homodimers in a calcium-dependent manner with other cadherin molecules on adjacent cells. p120 (sometimes called delta catenin) binds the juxtamembrane region of the cadherin. γ-catenin or gamma-catenin (plakoglobin) binds the catenin-binding region of the cadherin. α-catenin or alpha-catenin binds the cadherin indirectly via β-catenin or plakoglobin and links the actin cytoskeleton with cadherin. Adherens junctions were, for many years, thought to share the characteristic of anchor cells through their cytoplasmic actin filaments. The accepted model has been that adherens junctions serve as a bridge connecting the actin cytoskeleton of neighboring cells through direct interaction. However, scientists have not been able to isolate the quaternary complex of cadherin-βcatenin-αcatenin-actin in vitro. 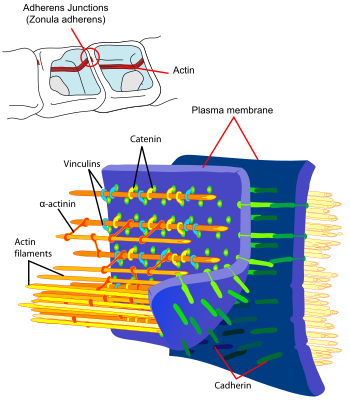 Recent data (2005) demonstrate that membrane- associated actin is several fold less stable compared to components of the adherens junctional complex. Additionally, the authors found that monomeric α-catenin preferentially binds to the cadherin junction complex through β-catenin. Dimeric α-catenin preferentially binds to actin and suppresses Arp2/3 complex-mediated actin branching, thus acting as a molecular switch to regulate actin polymerization. Adherens junctions may serve as a regulatory module to maintain the actin contractile ring with which it is associated in microscopic studies. ^ Pardo, JV, Craig, SW (1979). "alpha-Actinin localization in the junctional complex of intestinal epithelial cells". J Cell Biol. 80: 203–210. doi:10.1083/jcb.80.1.203. PMC 2110298. Retrieved 15 October 2014. ^ Guo, Renyong; Sakamoto, Hiroshi; Sugiura, Shigeki (October 2006). "Endothelial Cell Motility Is Compatible With Junctional Integrity". Journal of Cellular Physiology. 211: 327–335. doi:10.1002/jcp.20937. PMID 17167782. ^ Dowland S, Madawala R, Lindsay L, Murphy C (2016). "The adherens junction is lost during normal pregnancy but not during ovarian hyperstimulated pregnancy". Acta Histochemica. 118 (2): 137–143. doi:10.1016/j.acthis.2015.12.004. PMID 26738975. ^ Ferreri DM, Vincent PA (2008). "Signaling to and through the Endothelial Adherens Junction". In LaFlamme SE, Kowalczyck AP (eds.). Cell Junctions: Adhesion, Development, and Disease. Wiley VCH. ISBN 978-3-527-31882-7. ^ Yamada S, Pokutta S, Drees F, Weis W, Nelson W (2005). "Deconstructing the cadherin-catenin-actin complex". Cell. 123 (5): 889–901. doi:10.1016/j.cell.2005.09.020. PMC 3368712. PMID 16325582. ^ Drees F, Pokutta S, Yamada S, Nelson W, Weis W (2005). "Alpha-catenin is a molecular switch that binds E-cadherin-beta-catenin and regulates actin-filament assembly". Cell. 123 (5): 903–15. doi:10.1016/j.cell.2005.09.021. PMC 3369825. PMID 16325583. Wikimedia Commons has media related to Adherens junctions. This page was last edited on 27 November 2018, at 19:25 (UTC).